Well it is time to bring this live text commentary to a close. Join us again for Sunday's race to find out who will come out on top of what promises to be an absolute thriller. It could barely be much closer between Nico Rosberg and Lewis Hamilton, but maybe someone else will have something to say? A good natured top three with handshakes all round. But with the reigning world champion, a former world champion and the championship leader, there may not be the same kind of pleasantries on the circuit tomorrow. Each one will be desperate for the win. Istvan Simon: Not only the 4th pole in a row for Nico Rosberg. German beats Lewis on the 4th "Lewis-fav track": Monaco, Montreal, Silverstone & Spa. Sebastian Vettel, who qualified third, has given himself the perfect chance to avoid an unwanted record - that being the longest podiumless streak of his entire Red Bull career. That would be five races if he does not finish in the top three tomorrow, and he can take heart from his previous performances at Spa having been on the podium at each of the last three races there, winning in 2011 and 2013. Having to get past Nico Rosberg is clearly not a major cause for concern for Lewis Hamilton. He only needs to look back to his performance in Hungary last time out, where he spent more time ahead of his Mercedes's team-mate (39 laps) than behind him (31 laps), despite Rosberg starting from pole and Hamilton from the back of the grid. A case of mixed feelings for Lewis Hamilton? He is back on the front row after some nightmare qualifying days, but little mistakes surely cost him the chance of taking pole. Was there further reliability issues, or is he just trying too hard? Red Bull's Sebastian Vettel, who qualified third: "It would have been nice to have finished further up the grid, but obviously the gap is quite big. It was the best we could have don today. It was tricky out there. I got a fast lap in in the end, because the circuit picked up. It was tight for us behind the Mercedes - it was a good challenge and for sure, I'm happy with third." "Lewis Hamilton certainly looked out of sorts. He looked uncomfortable out there. A disc does not glaze itself, though, a driver is part of the process so I am sure when they have the analysis they will work out if it was a mistake on his part or the driving Gods again." Lewis Hamilton, who qualified second: "I had a glazed front left brake disc so the car was pulling to the left or to the right, and there was nothing I could do to get rid of it. I had to bring the brake balance further back, losing massive amounts out of Turn 1." "It's more fun in the dry, but it's still a huge challenge as Nico said - considering that it was quite good today." Mercedes' Nico Rosberg, who secured pole: "It is awesome at this track, it is one of the most special tracks of the year. It was not quite as difficult out here as some other occasions because the conditions was pretty much always intermediates. "I am really happy, the car was handling well. Together with my engineers we fine tuned it perfectly and got there in the end. It is only qualifying, a long race tomorrow but I am very happy. "Eau Rouge I was feeling good through it, really going for it and maybe that it where I made my time." McLaren's Kevin Magnussen, who qualified seventh: "I am pleased. It was tricky conditions. Q1 was close, I was lucky to get through but in the end Q3 worked out well. I had a good feeling in the car. It is a real pleasure to drive on this track, it is great fun and hopefully we can do what we came here to do - get some good points and a good result." "The lap never looked easy for Lewis Hamilton. He was struggling right from the start of it and every time he was up, because he was quickest in the first sector, small little errors cost him. Mercedes are so far ahead it does not really matter. I don't think there is any real disadvantage where they are starting from and I expect Hamilton to fight hard. He will want to close that gap as much as he can and I think it is very exciting. It is very finely poised." Nico Rosberg's pole position is his seventh of the season and fourth in a row. Lewis Hamilton's final effort is not enough as he finishes two tenths of a second off his team-mate. Fantastic stuff from Nico Rosberg as he just kept his cool throughout. 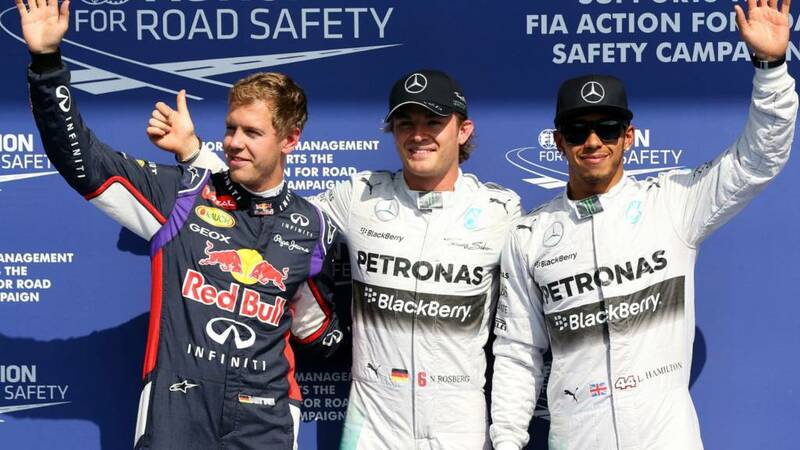 MERCEDES' NICO ROSBERG TAKES POLE POSITION FOR SUNDAY'S BELGIAN GRAND PRIX. The chequered flag is out and Lewis Hamilton is pushing now to try and get pole. It is surely all between himself and Nico Rosberg but a couple of mistakes for Hamilton might hold him back. Tense stuff. At the moment it is Nico Rosberg in P1 with Lewis Hamilton second, Sebastian Vettel third and Fernando Alonso fourth. Brief spell of relative silence as drivers dive in for fresh inters. Into the final two minutes. Helen Robertson: Certainly don't envy the drivers in those conditions! Russell: Why is the F1 not on the radio today? BBC Radio 5 live's coverage online. Lewis Hamilton improves considerably to move to within 0.6s of pacesetter and Mercedes team-mate Nico Rosberg. Hamilton then loses the rear end of his car at the final corner and plays it safe, he is comfortably clear of the rest at the moment with Sebastian Vettel's best time 2.4s off the Briton's. Nico Rosberg gets us off the mark with 2:05.698, with Sebastian Vettel's first effort of 2:08.141 putting him in P2, ahead of Fernando Alonso. Lewis Hamilton is ninth quickest at the moment. Lewis Hamilton runs wide at La Source but no drama, although he reports over team radio the car is pulling to one side. The track is drying out but will those rain showers in the distance have a part to play? Lewis Hamilton is straight out on the circuit, with Sebastian Vettel following him out. Fernando Alonso joins them before quickly gliding off at Les Combes on his first lap. Slippery out there. BBC pit-lane reporter Tom Clarkson: "I have just been told by one of the teams there are rain showers 7km from the track. It is dry now and whether those rain showers hit we don't know." Here we go then with the part of final qualifying. The Mercedes were some 1.7 seconds quicker than their rivals in Q2, but who will be celebrating pole in 12 minutes time? Pirelli: The two Mercedes in front again, Alonso comes third. Session run exclusively on the Green inters. Q3 next..
Daniil Kvyat just misses out and frustration seems to get the better of him as he spins after the chequered flag having had just one hand on the wheel, something appearing to have annoyed him. Lewis Hamilton finishes fastest in the second part of qualifying for the Belgian Grand Prix. Still the Mercedes duo leading the way and there is over a second between Nico Rosberg in P2 and Fernando Alonso in P3. With under three minutes left, Jules Bianchi, Romain Grosjean, Adrian Sutil, Sergio Perez, Jean-Eric Vergne and Daniil Kvyat are the six in danger. The rain looks to be getting heavier, causing a few wobbles for drivers. Lewis Hamilton skates over the top of Eau Rouge, displaying lightening-fast reaction to keep it together. Nico Rosberg runs wide soon after but improves, a 2:07.494 putting him just under half a second off Hamilton's best. Another Lotus finds itself facing the wrong way as Romain Grosjean follows Pastor Maldonado's lead with a spin, this time at La Source. Valtteri Bottas goes fastest with 2:08.591 but Fernando Alonso, Nico Rosberg and then Lewis Hamilton all go quicker. Rian Hoskins: Bianchi has been superb. One of the drivers of the season. He could have one more year at Marussia and could go to Ferrari for 2016. Emily Rogers: All I have done today is watch Formula 1! Romain Grosjean once again expresses concern about the rear end of his Lotus - he had the same concerns yesterday. Grosjean claims the first timed effort of Q2 with 2:13.974 but expect that to be bettered quickly. "This run could be the fastest of the session," Sergio Perez is told over the radio with the teams expecting more rain. Perez's Force India is one of 15 cars out on the circuit at the moment. Fantastic shots of steam coming off the trees around the circuit as we head into the second part of qualifying. The track is still looking very damp, with some rain looming on the horizon. Off we go. Nico Rosberg finishes fastest in the first part of qualifying for the Belgian Grand Prix. A big spin at the chicane for Pastor Maldonado and he will struggle to find what he needs to make it into Q2. Nico Rosberg goes fastest with 2:07.130, ahead of Lewis Hamilton and the Williams pair of Felipe Massa and Valtteri Bottas. Lewis Hamilton, in P1, goes even faster with 2:07.280. Pastor Maldonado, Sergio Perez, Max Chilton, Marcus Ericsson and Andre Lotterer are the ones in trouble as teams warn over the radio a fear of impending rain. Alex Davenport: That's skill! Hamilton makes a mistake and still runs fastest. Ck Chandu: Classic Spa and wet weather! This is perfect! Dante Banks: Rain affected qualifying at Spa. Excellent! A hold-your-breath moment as Kimi Raikkonen slithers through Eau Rouge. He keeps it together, though, and eventually moves up to fifth with 2:10.631 with three minutes remaining of Q1. Lewis Hamilton improves with 2:07.587 as Mercedes team-mate Nico Rosberg moves into P2 with 2:07.792. Esteban Guttierez pulls over at Turn 15 and comes to a stop with a technical problem. His qualifying is over. Meanwhile, teams are vigorously heating up the pit-lane while the cars are out on the circuit. Let's hope another downpour doesn't wash away their hard work. Lotus: After you've done the pit box Phil, could you get out there and dry the racing line too? Lewis Hamilton's race engineer: "Keep pushing." Hamilton replies: "Please don't speak to me on my lap." Daniil Kvyat briefly leads the way as he clocks 2:14.966 before Valtteri Bottas moves into P1 with 2:10.750. Lewis Hamilton, on inters, runs off at the chicane but still manages to slap the fastest lap on the board with 2:09.492. Lotus: Both Romain Grosjean and Pastor Maldonado are out on inters for Q1 tiptoery. A mix of intermediate and wet tyres on show as several drivers head out for exploratory laps. Sergio Perez is told over team radio there could be some rain towards the end of Q1. The first qualifying segment begins with the Marussias of Jules Bianchi and Max Chilton leading the first few drivers out on to the circuit. Huge sprays of water hit the on board camera of Caterham's Andre Lotterer as he navigates the wet circuit. Thompson Beeby: Looks like it's stopped raining. Joel Fothergill: Spa is ridiculous. Hail stones and now a cloudless sky?! If you just tuned in to BBC One now, you would not believe what the weather was like at Spa barely 30 minutes ago. There are blue skies now, when earlier those at the circuit had to endure heavy rain and even a hail storm. Just under 10 minutes to go, so a quick reminder on how qualifying works. The session will be split into three, the first will see the six slowest drivers knocked out, the second will see another six knocked out and that'll leave 10 to fight it out for pole position in a 12-minute shoot-out. It is wet, it is Spa, it is gloriously unpredictable. Valtteri Bottas has been in the top three on the grid three times in the last four races. Williams' deputy team principal Claire Williams, speaking to BBC Sport: "There is no reason why, with the remaining races we have, that we could be looking at challenging Red Bull. "Our car has proved it has been competitive at every single race we have gone to. We just have to make sure our drivers finish in strong points position. "Valtteri Bottas likes this kind of weather, we are looking forward to qualifying, it has dried out so hopefully it stays dry. It is strange as a team a few years ago we would have been desperate for rain." BBC weather reporter Ian Fergusson: "Back edge of the current shower only 10km to the west, so some room for optimism for qualifying to start on time, drainage allowing. However, further showers developing upstream about 30km away so further rain possible into the qualifying hour." Nick Woodward: Qualifying might be interesting in that rain...! CB_Lucian: Let's hope Lewis can impersonate Moses - i.e. parting of the waves! Harkirth Gill: I think Lewis Hamilton can get pole today - he always goes strong at Spa Francorchamps. McLaren: British acting legend and McLaren F1 owner Rowan Atkinson pays the McLaren garage a visit. Nice to see you, Rowan. As the previous entry shows, Lewis Hamilton got pole last year, but Sebastian Vettel went on to win the race. Hamilton won in 2010. "Caterham have replaced Kamui Kobayashi with three-time Le Mans winner Andre Lotterer for this race and although they say the Japanese is still 'part of the team', there is no guarantee he will ever race for them again. "Caterham have some upgrades on the car this weekend, including a redesigned nose - mercifully, some might say, after what even the team consider the aesthetic abomination of the original one. Albers says the performance of these will be analysed back at the factory before making a decision on drivers for the next race at Monza. 'The most important thing is we need to have the best driver available in the car,' he said." Just over 30 minutes until qualifying gets under way, so let us be having your predictions. Anything could happen with this rain, so let us know you tips for first, second and third. #bbcf1, text 81111 (UK only) or head on over the BBc Sport Facebook and Google+ pages to have your say. Marussia: On the way to absolutely banging it down in the Spa paddock! Bang on time, the rain arrives, and boy does it arrive! Suzi Perry and Eddie Jordan have had to abandon their umbrellas in what has developed into quite apocalyptic conditions - massive hail is battering the bemused gathering of people in the paddock. BBC weather reporter Ian Fergusson: As of 1210 BST: Rain expected in circa 10 mins. Looks moderately heavy on radar so a proper soaking of circuit will be net result. "Eau Rouge might be more of a challenge this year, but an F1 driver's cup is often half-empty. Jenson Button explained that taking away downforce had also had a less attractive effect on the corner that in recent years has been the most difficult at Spa - the downhill double left-hander called Pouhon. "'You lose other corners,' he said. 'You lose Pouhon. That's the thing, really. It's a balancing act. I'd rather have more downforce. These things are very quick in a straight line. If you watch them through Eau Rouge, it looks great on camera but having a snap of oversteer through there is not that nice at over 300km/h. But Pouhon, it's lost speed a bit, a bit wallowy through there.'" Suzi Perry, Eddie Jordan and David Coulthard have positioned themselves at the top of the iconic Eau Rouge corner. The umbrellas are out. Rain for qualifying? If you switch on your telly box or refresh this very page you will notice that BBC One build-up is already under way for qualifying, kicking things off with a bubbly little piece on Belgium - the host of this weekend's grand prix. Get yourself settled in and enjoy. Hello! Welcome back to coverage of qualifying for the Belgian Grand Prix. Nico Rosberg is bidding for his fourth straight pole position to put himself in prime position to extend his 11-point lead over Mercedes team-mate Lewis Hamilton in the world championship, and the pair have certainly given a strong indication they could be challenging for the front row with dominant displays in practice. But, for the first time since the British Grand Prix, there was not a Mercedes at the top of the timesheet in final practice, with that honour going to Williams' Valtteri Bottas this morning. Could the battle for pole turn out to be closer than anticipated? For all their dominance this season, Mercedes have not locked out the front row at each of the last four grands prix. Lewis Hamilton, in particular, has endured his fair share of qualifying woes in recent races, suffering brake disc failure in Q1 at the German GP, before his engine caught fire in Hungary last time out. Is his luck about to turn? Andrew Benson's final practice report is up, so I'll leave you with that as we briefly put this live text commentary on hold. Join us again at 12:00 BST for build-up to qualifying, where the threat of rain could make things very interesting indeed. Oooops! Kimi missed the window to go out before the chequered flag, drove to the end of the pit lane and has to get pushed back. Valtteri Bottas was eliminated in Q1 at Spa last year, but he won GP3 Race 1 on the circuit for ART back in 2011, his title-winning season. Red Bull team principal Christian Horner, speaking to BBC Sport: "It is only Saturday morning, it was a good lap at the end by Daniel Ricciardo, the circuit was getting better and better. Now we will see what the weather does. "We just tried a few different things between all the cars. Sebastian Vettel missed a lot yesterday so we just tried a few things. So it is a Williams that sets the pace in final practice, ending a Mercedes dominance of these sessions this season, but you suspect Nico Rosberg and Lewis Hamilton were not showing their hand this morning. WILLIAMS' VALTTERI BOTTAS FINISHES FASTEST IN FINAL PRACTICE FOR THE BELGIAN GRAND PRIX. Speaking of Pastor Maldonado, he had the only crash in practice for the Belgian Grand Prix yesterday, but there was quite a hair-raising incident in a rain-affected GP3 practice involving rookie Konstantin Tereshchenko. The 20-year-old Russian lost control under braking and went over the kerb at the final chicane, sending his car high into the air, barrel rolled and then collided with the barriers before catching fire. Fortunately, Tereshchenko was unhurt. It was his first-ever run in the car too. Pastor Maldonado has a little wobble at the top of Eau Rouge as sparks kick out from under his Lotus. Meanwhile, Valtteri Bottas is back at t the top of the timesheet, clocking 1:49.465. Nico Rosberg's first effort on the softs is not quick enough to displace the Williams, as the German goes round in 1:49.739. Force India: All back in, the crew getting ready for the next run as Checo enjoys some light daytime programming. Kimi Raikkonen, a four time Belgian Grand Prix winner, has soft tyres bolted on his Ferrari and he goes fastest with the new boots on, clocking 1:49.817. Most of his fellow drivers dive in to also make the switch to softs. Mercedes: Nico Rosberg charges to P1, but Lewis Hamilton pips him by ONE THOUSANDTH of a second! Incredible!! So evenly matched!!! That they do as Nico Rosberg knocks a second off Fernando Alonso's best effort to go top with 1:50.023. Anything you can do, I can do better says Lewis Hamilton, though, as he sneaks above Rosberg with a marginally faster lap, just 0.001 seconds quicker to be exact. A mistake at Turn One sees Fernando Alonso round in 2:06.968 but a faultless run with his second timed effort sees him go fastest as he rattles off a 1:51.218. Less than 10 minutes left, though, and surely not long before the Mercedes' duo show their teeth? Lewis Hamilton's first timed effort of 1:52.253 puts him fourth fastest, before his Mercedes team-mate Nico Rosberg slots in second with 1:51.729. "Getting the Mercedes camera ready for filming pit stops - every team has one which they can analyse from." The medium tyre is the compound of choice, although both Caterham drivers have gone out on the soft tyre. The circuit has pretty much dried out, with just one or two darker patches to be seen as early leader Esteban Guttierez sees his best lap time sent tumbling down the board, with Valtteri Bottas going fastest with 1:51.583, ahead of Kimi Raikkonen and Nico Hulkenberg. Sergio Perez has a picture of the Pope for company in his Force India as he readies himself for the last 20 minutes of this session. Drivers are pouring out on to the circuit now and it should not be too long before the timing board lights up further. Williams: The garage bursts into action as the slick tyres are brought in and bolted on.... Almost ready to head out. Esteban Guttierez is out on the medium tyres and becomes the fourth driver of the day to clock a timed lap as he goes round in 2:00.242 on the empty circuit. He makes a big improvement with his next effort with 1:56.151 setting the current benchmark. No-one else coming out to play just yet, but a few gloves and helmets are being strapped on, so should not be too long. Quite a decent number of people in attendance today, even though there has been little for them to watch on the circuit so far and most have instead had to occupy themselves with their phones. Heads look up, though, as Esteban Guttierez breaks the silence and heads out on his lonesome. Ferrari: The track is drying, so the drivers will be running in the next minutes. Andy H: Great timing there on the question about Jenson's contract :-)) JB to stay in 2015 links to Honda and development experience? "Who is going to be the first one out and dry the circuit out even more? It will usually be the likes of Marussia or Caterham who need to get the laps in. It is still looking pretty wet going up to La Source but it won't be too much of an issue and most will be out in the next five or seven minutes." A few drivers are getting strapped into the cars and we will likely see some action soon, with just over 30 minutes of the session remaining. BBC pit-lane reporter Tom Clarkson takes advantage of the lull in on-circuit activity to grab a word with McLaren managing director Jonathan Neale. A slightly awkward moment as Clarkson asks about Jenson Button's future and the 2009 world champion's overhears as he pops out of the garage, cupping his ear. Neale, though, gives nothing away, saying: "Jenson is a fabulous guy. A worthy champion and it is a great to have him in the team. As you can expect we are not going to tell you about contracts. We are not in any rush and we won't be announcing anything before the end of the season." Jenson Button is out of the car in the McLaren garage as teams wait for the circuit to dry out further. Button will be hoping for a good result on Sunday, with his future in Formula 1 up in the air. "It's not often that Marussia find themselves at the centre of attention in Formula 1, but for a short while this weekend that has been the case, following the bizarre story surrounding Max Chilton. "First, the team announced on Thursday he had been dropped, then Chilton himself said he had voluntarily stood down to allow the team time to raise money. And then just as his stand-in, reserve driver Alexander Rossi, headed out for his first laps in first practice, the team announced that Chilton would be racing after all. "Most believed the problem centred on the non-payment of Chilton's sponsorship funding, but the man himself said 'there have been lots of rumours that aren't true. There's a lot more going on behind the scenes.' He declined to say what that was, however." Jules Bianchi moves top of the embryonic timesheet with 2:01.823, before vacating the circuit to leave his Marussia team-mate Max Chilton all alone. Chilton goes round in 2:07.529 before heading in himself to leave the circuit temporarily empty. "Andre Lotterer did a good job on his first appearance at a grand prix weekend - 12 years after he was test driver for Jaguar. The German, who grew up in Belgium, was 0.091secs quicker than team-mate Marcus Ericsson in first practice and just 0.043secs behind in the second session - impressive for a man who had never driven the car before up against someone who has been in it all season, even if Ericsson is not exactly Fernando Alonso. "Lotterer said he still had work to do to understand all the car's functions, and was 'just building it up in terms of speed'. Technical director John Iley pointed out with good reason that perhaps he should not have been passed over by F1 in his youth. Ericsson said he was surprised to find an F1 car was slower in the corners than his Le Mans Audi, but then it is only a Caterham." Andre Lotterer, in the Caterham car this weekend in place of Kamui Kobayashi, is the first driver to stick a time on the board as he is round in 2:07.529. He doesn't sound best pleased over team radio with the handling of the car, though. Marussia: Installation laps complete and we are on our way for our first run of the morning. "Ferrari looked competitive on Friday, with Fernando Alonso next fastest behind the Mercedes on one-lap pace in both sessions. But then they often do, only to sink back to the normal level afterwards. And the same thing looks likely here. "Mercedes are in front, with Red Bull and Williams closely matched behind them and Alonso two or three tenths further back. About what would be expected in other words. Alonso described driving at Spa - where he has never won, despite his illustrious career - as 'a real pleasure'. But admitted: 'At this track and at Monza, engine performance counts for a lot. We know there is no magic solution.' He will doubtless be hoping for the rain that is expected for qualifying to materialise." A late arrival on the circuit as Fernando Alonso heads out for Ferrari on inters, cautiously navigating the damp turn into Les Combes on his way to completing his installation lap. Pretty quiet on the circuit as most drivers head back in after installation laps for their usual checks. It is just the Mercedes duo of Nico Rosberg and Lewis Hamilton out there at the moment, with the latter doing a practice start on the full wets. Force India: Both drivers ready in the car and already out for their first runaround of FP3. Rain has ceased but still track damp. Most drivers have ventured out for an exploratory lap with the majority out on intermediates. Valtteri Bottas,Felipe Massa and Lewis Hamilton are out on full wets. "The circuit is already drying and you can see lighter patches. I think it will be pretty quick before someone goes to slicks. The temperatures are building too with track temperature up to 16C." BBC pit-lane reporter Tom Clarkson: "The teams are saying no rain is expected during this session but that it is going to rain during qualifying. That means we will likely see wet or intermediate tyres art the start of this session." No rain at the moment as the first few drivers head on out for final practice, and it seems the teams are not expecting any in this session, although it could be a very different story for qualifying. "Would the drivers still be able to take Eau Rouge flat out with the reduced downforce and greater straight line speeds this season, people wondered ahead of this weekend? "Yes, is the answer, but with more difficulty - and after seeing Lewis Hamilton's 'moment' there in P1 you didn't need a driver to tell you that. 'It's still flat,' said McLaren's Kevin Magnussen with Scandinavian understatement, 'but it's a little bit more exciting.' Team-mate Jenson Button was a little more descriptive. 'Eau Rouge is, er, interesting,' he said. 'A few screams out of my crash helmet through there a few laps, especially on high fuel. This is a place you always have moments. Even in Blanchimont I've had a couple of moments that you don't experience normally in F1 because most of the circuits are slower and have massive run-offs.'" Red Bull's Daniel Ricciardo: She's a bit more how you going through here this year. Paul Whitehouse: Really hoping Lewis' "racer" mentality will pull him through this year: no more bad luck, please! Sauber: "The track is still wet but seems to dry off. 10 min to go for #FP3 and the clouds are coming..."
All change again it seems. Oh Spa, you beautiful, unpredictable venue. Right then, here is what we have coming up today. First up there is one hour of third and final practice, which gets under way at 10:00 BST and you can follow the action via this live text commentary, as well as watch on BBC Two from 09:55 BST. Then, qualifying begins at 13:00 BST, with BBC One coverage of that beginning at 12:10., with audio and video commentary online. There is very little need for you to venture off anywhere today. just tweeted this picture showing plenty of blue above the drying ground. "So far, it has been another disheartening weekend for Sebastian Vettel. A problem with his car's hybrid system meant he managed only 11 laps before needing to stop running in first practice and had to miss the second session entirely for the engine to be changed. "Vettel said missing practice was 'not ideal - it is important around here to get your eye in. Every year is different here. It is a long lap, there are a lot of high-speed corners and therefore it is important to have a rhythm whereas at a slower track it is a bit easier.'" not even former world champions can agree. Nigel Mansell, winner of the 1992 title, believes Lewis Hamilton will collect his second championship, while 1979 champion Jody Scheckter has plumped for Nico Rosberg. Google+ pages to share your views. "Morning all. Quali day and it's wet. Grey morning here at Spa." "As opening salvoes go, the one Lewis Hamilton fired at Spa on Friday was pretty emphatic, and if he wanted to make a statement of intent to team-mate Nico Rosberg, it was a pretty powerful one. Hamilton was in scintillating form in second practice, beating Rosberg by more than 0.6 seconds. "True, Rosberg ran a little wide and kicked up some stones on the exit of Malmedy, but that won't have cost him much more than 0.1secs. 'It's great to be back in the car and it was feeling good out there,' Hamilton said. "But it's not the first time this season that Hamilton has looked imperious on Friday, and several times Rosberg has studied his telemetry overnight and found the time to match him on Saturday. Can Hamilton hang on to his advantage this time and - even more importantly - have a clean qualifying day for the first time since Spain in early May? And how will the overnight rain affect things if it remains wet?" Hello! Welcome to qualifying day for the Belgian Grand Prix. If practice on Friday told us anything, it is that things are very much as you were after the summer break, with Mercedes looking dominant. Twelve months ago, Sebastian Vettel secured a victory at the Belgian Grand Prix that was to be the first of nine in succession as he blitzed his way to the title. This time, it is Lewis Hamilton and Nico Rosberg who are battling it out for championship, a two-way shootout that is incredibly close to call. But could one of the two take victory at Spa tomorrow that may just set them on the way to a similar run of dominance to the one Vettel enjoyed?